Flaxseed is one of those things that I have had on my radar for a while but never really understood. I’ve always been interested in seeing what it is all about so, when I was visiting my parents in Atlanta last June, I picked some up at the Dekalb Farmers Market. I have had the ground flaxseed in my pantry for almost a year and I am FINALLY using it. 1. It has been cultivated since 3000 BC in Babylon! 2. There have been studies that show it may reduce risk of heart disease, cancer, stoke and diabetes. 3. It is high in Omega-3 fatty acids (the good fat). 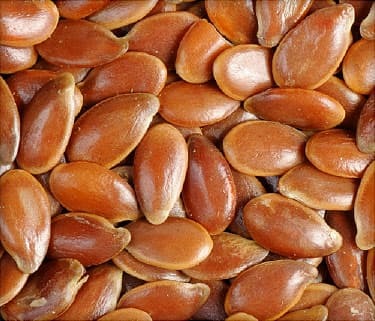 1 tbsp of ground flaxseed (flax meal) contains 1.8 grams of omega-3s! 4. They contain 75-800 times more lignans (chemical compound found in plants) than other plant products. Lignans contain estrogen and antioxidant qualities. 5. Flaxseed contains both soluble and insoluble fiber. This means it helps with digestion! The most important thing is that you buy ground flaxseed because your body cannot absorb it otherwise. Just add a tablespoon of two to your morning smoothie, yogurt or oatmeal and you’re good to go. You will definitely notice a difference in your digestion and it can help you in the long run as well! This entry was posted in Misc. and tagged 1 point, Atlanta, farmers market, Flax, healthy. Bookmark the permalink.